Here's where I'll post things I do by hand (I'm left-handed, by the way). Drawings, doodles, etc. Please note that I'm not a professional drawer, nor have I been doing drawing for many years since I was five years old or something like that. So don't be overly surprised or icked out if they look...well...crappy. And, please, no put downs or harsh comments. Constructive criticism is okay...but nothing negative. And please don't forget to read the introduction and information about the scrapbook section if you haven't done so, already. Thank you. Comments: Another assignment I had for my sociology/psychology class. Again, I had to either write or draw for this assignment. This time it was for explaining or describing the Theories of Motivation. I thought the drawings came out really cute and I absolutely loved how it turned out. I especially love how I drew out the third panel, "Evolutionary." 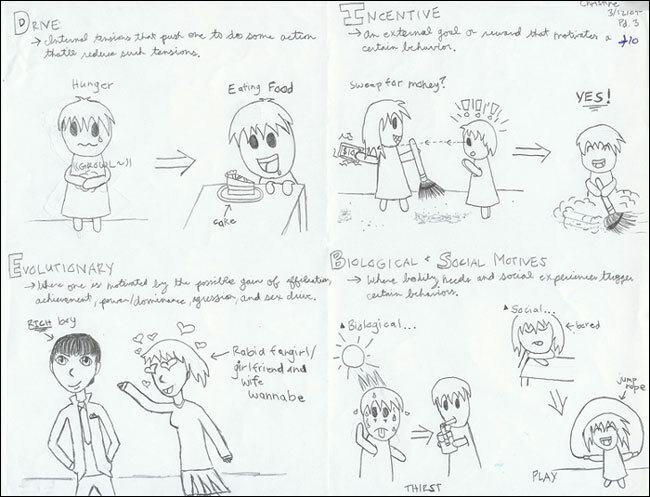 Comments: This is actually an assignment I had for my sociology/psychology class. 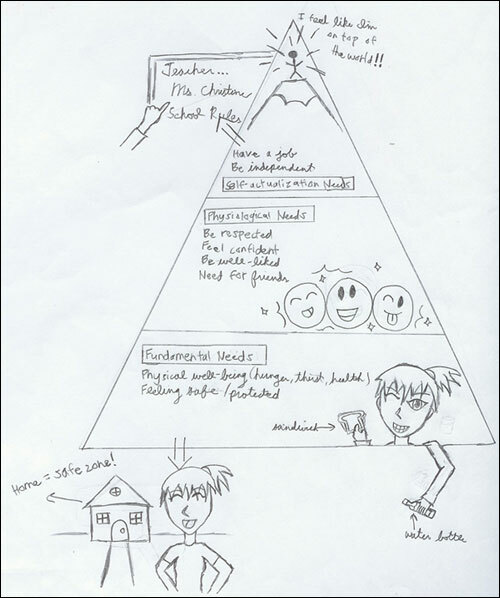 I had to either write or draw out an explanation of Maslow's Hierarchy of Needs. I ended up doing both -- writing a bit, and drawing some examples. Sure, it's not exactly a "(doing) serious drawing" as with all my past ones, but I still like how it turned out. And I got an A on it, anyways. 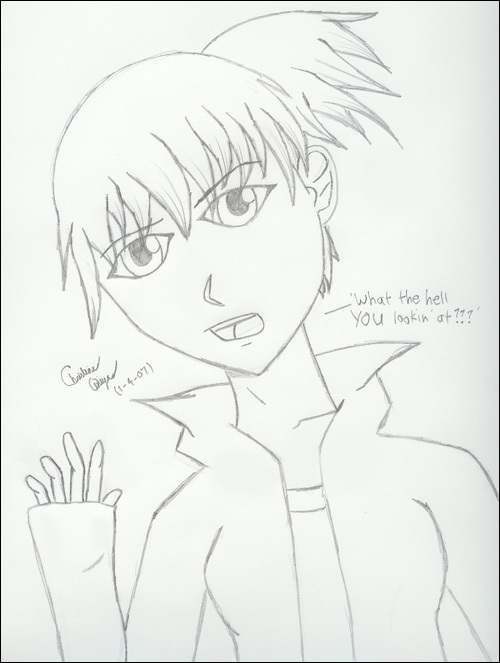 Comments: Hah, I like the quote I put for her...that's why she has a raised eyebrow. It's quite fitting, I think. I was testing out with drawing a different sort of clothing, though, rather than the expression. Hence the jacket with its wavy collar. I really love how this drawing turned out -- I thought her hair turned out exceptionally pretty. 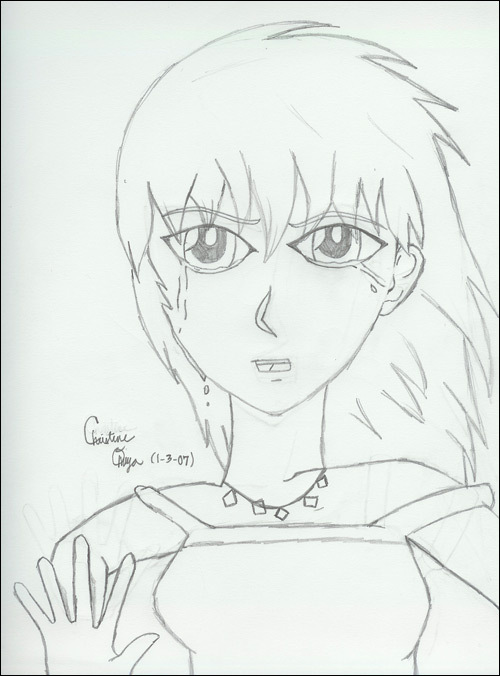 Comments: Pretty much my first attempt at "fanart"--that is, drawing a character created by someone else. 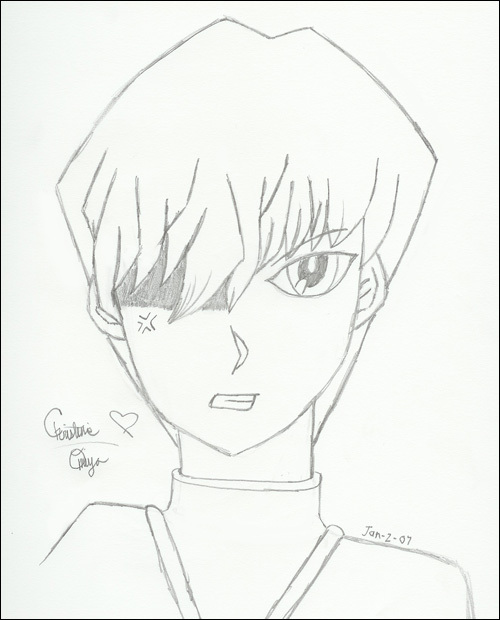 Since one of my biggest obsessions is Yu-Gi-Oh, I decided to draw Seto Kaiba from the anime. Truthfully, I thought he would be one of the easier characters to draw since he didn't have an outrageous hair style like Yugi... Ironically, though, it's the very thing that screwed me over. I drew his bangs too long on the right side of his face. And since I didn't really want to go through the pain of trying to do it all over again, I just opted to have that one eye "hidden" in the shadows.